Home / Editor's Choice, Entertainment News, Featured Articles, Gossip and Drama, Videos / DRAMA as one of BONI KHALWALWE’s bulls was used to bury a dead body in a funeral, this is not witchcraft (VIDEO). 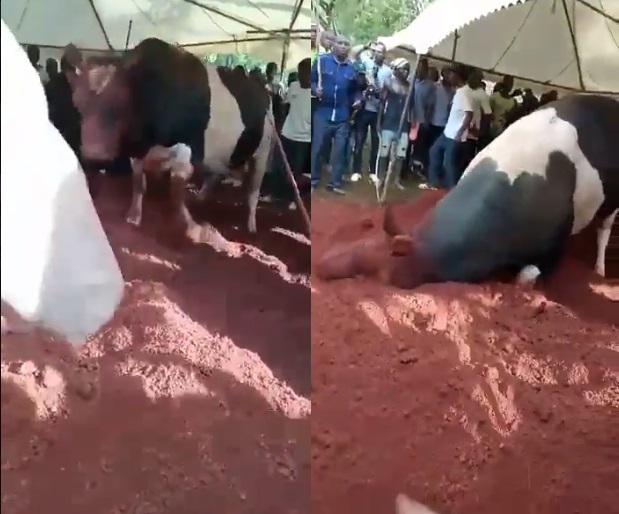 DRAMA as one of BONI KHALWALWE’s bulls was used to bury a dead body in a funeral, this is not witchcraft (VIDEO). Monday, September 10, 2018 - Former MP, Boni Khalwalwe, caused a stir on twitter after he shared an interesting video showing one of his bulls burying a dead body in a funeral. Mourners cheered the bull when it was burying the body in the bizarre incident that left many people shocked. You can only see such madness in the Luyha land.